Editor’s Note: For the remainder of June we will be counting down our 10 favorite columns as we celebrate summer vacation. Coming in at number 5 on our countdown is a column from May 6, 2015. After receiving a one year stay of execution, the appeals process for a historic ballpark in Orlando, FL. ran out last week and the grandstands of Tinker Field began to crumble in the name of progress. Think of almost any baseball player from the 20th Century and odds are pretty good that they stepped foot on the infield grass of Tinker Field at one time or another. 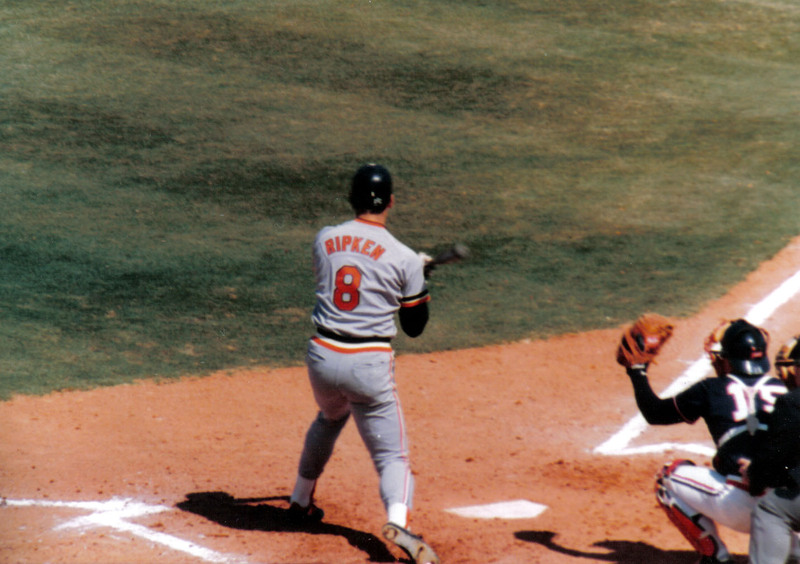 For several years one of the highlights of my birthday was seeing Cal Ripken, Jr. and the Baltimore Orioles play at Tinker Field. From Spring Training for Major League Baseball, to full seasons of Minor League Baseball, the quaint little ballpark in the shadow of the Citrus Bowl was a unique venue where a who’s who of baseball players played from 1923 to 1999. 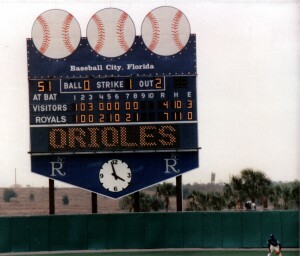 The last professional affiliated baseball at Tinker Field occurred in 1999 with the Orlando Rays who were the Double-A farm team for the Tampa Bay Rays. 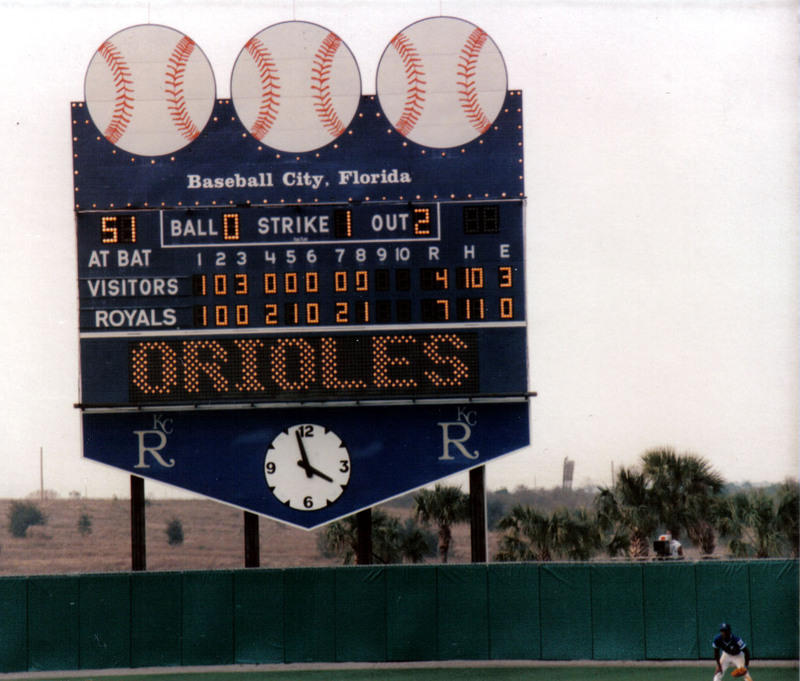 While the Orlando Rays were the last of the Southern League teams to call Tinker Field home, they certainly weren’t the only ones. The Orlando Twins, Orlando Cubs and Orlando Sun Rays were among the many teams to call Tinker Field home. The Orlando Juice of the Senior Professional Baseball Association (SPBA) even spent a season playing on the hallowed field in the shadow of the Citrus Bowl. 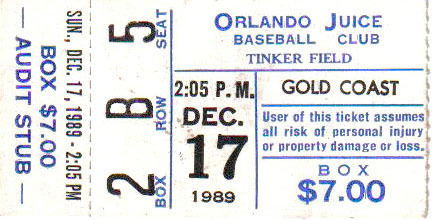 This ticket stub allowed me entrance to Tinker Field where I ended up meeting one of my favorite baseball figures Earl Weaver outside the third base dugout. Eventually it was the shadowy neighbor looming over right field that signed Tinker Field’s death warrant. While time and neglect certainly played a role in the demise of the nearly century old facility, it was a massive expansion of the Citrus Bowl that hastened the demise of Tinker Field. The expansion of concourses crept into right field to the point that Tinker Field could no longer function as a professional baseball field due to an outfield depth that would make a Little Leaguer feel like Barry Bonds sending everything he hits over the fence. Tinker Field becomes the third ballpark from my youth to be torn down joining Memorial Stadium in Baltimore and Baseball City Stadium in Haines City, Florida. So, despite being declared a national historic site, the demolition of Tinker Field is in full swing with the goal of removing every trace of grandstand, bleacher and dugout before a June Rolling Stones concert takes place at the Citrus Bowl. Of course, while I can’t get no satisfaction in the fact that the stands where I spent summer nights of my youth will soon be reduced to dust, I can take some solace in the fact that the actual playing field will be saved as a small nod to the history that occurred there. There is also some solace in the fact that many of the seats from Tinker Field were removed and will be sold to fans for use in their dens and Florida rooms. Still despite saving some seats and the clay and grass part of Tinker Field, it will not really be Tinker Field anymore without the stands which once echoed with the sounds of the crack of the bats, cheering fans, and the Caribbean accented shouts of a peanut vendor who looked an awful lot like O.J. Simpson. Tinker Field becomes the third ballpark from my youth to be torn down joining Memorial Stadium in Baltimore and Baseball City Stadium in Haines City, Florida. Of the three lost Ballparks the loss of Tinker Field hits the hardest as it is the one where I made the most baseball memories. Tinker Field was where I first was able to see a live Spring Training baseball game on my birthday which is a tradition I still try to maintain each year. Tinker Field was where I met and spoke with the late Earl Weaver on the third base line. While I saw numerous Spring Training games at Tinker Field, it was Minor League Baseball that really grabbed my attention and stoked the desires of younger me to work in sports promotions at a ballpark. Tinker Field was also where I saw the Clown Prince of Baseball himself, Max Patkin, perform his shtick on a sunny Florida day. During our trips to Tinker Field my mom and I were often joined for a few innings by team president, Pat Williams, who was also the General Manager of the Orlando Magic at the time, and I used to think how cool it would be to be a team executive getting paid to watch baseball. I have yet to fully realize that dream of spending all of my summer nights as a Minor League Baseball employee but I may yet before all is said and done and when I do it will be because of those nights at Tinker Field. I last visited Tinker Field in 1999 when the souvenir stand was offering clearance merchandise since the Rays were moving to a ballpark at Walt Disney World and it was easier to sell everything at a discount instead of moving it to the new facility. I ended up getting an Orlando Rays fitted cap. To this day I am amazed that the employee correctly guessed my hat size just by looking at me. I am also amazed that in the years since my head has grown to the point where I can no longer comfortably wear the fitted wool cap. I don’t know what happened to that vendor but I like to think he lived out his remaining years comfortably after his days at the ballpark were over randomly telling people on the street how big their heads were. 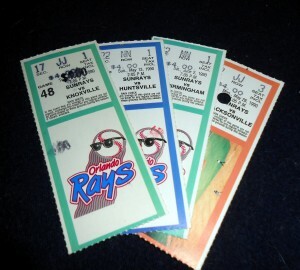 I last visited Tinker Field in 1999 when the souvenir stand was offering clearance merchandise since the Rays were moving to a ballpark at Walt Disney World. 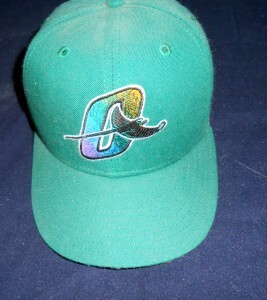 I ended up getting an Orlando Rays fitted cap that I treasure to this day. The Orlando Rays’ time at Walt Disney World was short lived and the team moved to Montgomery, Alabama and became known as the Biscuits. To this day there are still no Minor League Baseball teams in Orlando making the decision to tear down Tinker Field an easier pill to swallow for some. Others point to the peeling paint and overworked plumbing as reasons that it is best to raze the ballpark instead of spending money to preserve it and bring it up to current code. In Houston people are dealing with a similar potential loss of a treasured sports fixture as the pending demolition of the Astrodome seems all but certain. Recently fans were allowed inside the Astrodome as part of its 50th birthday celebration. The long term fate of the so called “eighth wonder of the world” is unknown. Like Tinker Field the Astrodome last hosted professional baseball in 1999. With each year that passes it seems more and more likely that the Astrodome will also fall victim to a wrecking ball despite its historical significance. The loss of the physical building, while difficult, does not take away the memories that occurred in those facilities. Just as I am sure that there are people with fond memories of whichever Ballpark they grew up with, I can close my eyes and still picture Tinker Field the way I remember it right down to the tennis ball throwing peanut vendor, and the sounds of the rattling ceiling fans that tried their best to cool fans on those humid Florida nights. I prefer to think of Tinker Field like it was, and not like the neglected facility it became. The wheel of progress is always turning and sometimes it brings a bulldozer with it to raze the buildings of our youth. Ticket stubs like this one from a Spring Training game at Baseball City Stadium, and memories, are all that are left from the three Ballparks from my youth that have been torn down. I guess the morale of the story is to treasure your brick and mortar Ballparks while you can while building up memories that can last long after the Ballparks are gone. Now if you’ll excuse me, I have some Ballpark memories to preserve. The other day I learned some troubling news about an old friend. Growing up this friend and I shared many adventures during the spring and summer months with family and friends. Sadly time and neglect have finally taken their toll on my good friend, Tinker Field, and at the ripe age of 91 years old he is facing extinction. Tinker Field, my good friend, is a ballpark in Orlando, FL that I have written about many times. It was at Tinker Field that I saw most of my professional baseball games during the 20th Century. From Spring Training for Major League Baseball, to full seasons of Minor League Baseball, the quaint little ballpark in the shadow of the Citrus Bowl was a unique venue where a who’s who of baseball players played. In the late 80’s and early 90’s I saw quite a few Southern League games at historic Tinker Field. While the Orlando Rays were the last of the Southern League teams to call Tinker Field home they certainly weren’t the only ones. The Orlando Juice of the Senior Professional Baseball Association even spent a season in the shadow of the Citrus Bowl. A massive expansion is planned for the Citrus Bowl that will greatly widen its footprint. Unfortunately this widening will creep into right field to the point that Tinker Field can no longer function as a baseball field due to an outfield depth that would make a Little Leaguer feel like Barry Bonds sending everything he hits over the fence. So, despite being declared a national historic site Tinker Field will likely soon meet the fate of many ballparks before it and be torn down in the name of progress. There is still a small glimmer of hope that the ballpark structure can be saved. There are petitions and social media campaigns already in full swing. In the event that cries from the Tinker fans fall on deaf ears, a halfhearted attempt to appease fans who will miss the ballpark by creating a new Tinker Field a few hundred yards away on the site of a current softball field has been floated by local officials. Still despite calling the new ballpark Tinker Field, there will never be another Tinker Field and every effort should be made to preserve the historic grandstand and related facilities. If the wrecking ball does come, Tinker Field will become the third ballpark I attended games at to be torn down. Despite missing Memorial Stadium in Baltimore and Baseball City Stadium in Haines City, Florida the loss of Tinker Field hits the hardest. Tinker Field was where my mom and I spent many afternoons and evenings together watching games despite it being in a part of town where one did not want to really venture too far away from the safety of the ballpark lights. This ticket stub allowed me to meet one of my baseball heroes, Earl Weaver, along the third base line of Tinker Field. Tinker Field was also where I met the late Earl Weaver on the third base line. I met many other players at Tinker Field through the years with some of them making it to the Majors and others relegated to a career of being bused from game to game in the Minor Leagues. While I saw numerous Spring Training games at Tinker Field it was Minor League Baseball that really grabbed my attention and stoked the desires of younger me to work in sports promotions at a ballpark. During our trips to Tinker Field my mom and I were often joined for a few innings by team president Pat Williams, who was also the General Manager of the Orlando Magic at the time, and I used to think how cool it would be to be a team executive getting paid to watch baseball. I last visited Tinker Field in 1999 during a University of Central Florida football game. At the time UCF played at the Citrus Bowl since it did not have a stadium of its own yet. During a pregame tailgate I learned that the souvenir stand at Tinker Field was open since the Rays were moving to a ballpark at Walt Disney World and the team was selling all of their merchandise to avoid moving it to the new facility. During my last visit to Tinker Field in 1999 I was fitted by sight for this hat. Sadly, the hat no longer fits but the memory of getting it remains as vivid as ever. I ended up getting an Orlando Rays fitted cap. To this day I am amazed that the seasoned ballpark employee correctly guessed my hat size just by looking at me. I am also amazed that in the years since my already large head grew to the point where I can no longer comfortably wear the fitted wool cap. I am sure the cap vendor had done the same thing thousands of times but it was fascinating to me that he had that skill. I don’t know what happened to that vendor but I like to think he lived out his remaining years comfortably after his days at the ballpark were over randomly telling people on the street how big their heads were. In the end the Orlando Rays’ time at Walt Disney World was short lived and the team moved to Montgomery, Alabama and became known as the Biscuits. To this day there are still no Minor League Baseball teams in Orlando making the decision to tear down a nearly 100 year old Ballpark an easier pill to swallow for some. I knew that the day would come when Tinker Field would be torn down in the name of progress. I had hoped that the day was further into the future but knew deep down that people in government do not seem to always value their history and often times the bulldozer wins out over preserving the past. In Atlanta fans of the Braves of preparing for the loss of 20-year-old Turner Field in the name of progress. A few years back even Yankee Stadium, of Babe Ruth fame, was torn down so I know that the loss of Tinker Field is not totally out of line with the rest of the world of sports but it is still sad day. While the Astrodome, Yankee Stadium, and Turner Field cannot compete with the intimacy of Tinker Field fans of those venues are justified in feeling their loss. But as I have said before the loss of the physical building, while difficult, does not take away the memories that occurred in those facilities. I can close my eyes and still picture Tinker Field the way I remember it. I prefer to think of it like it was and not like the neglected facility it became. Now if you’ll excuse me, I have some ballpark preservation petitions to sign.